Are you a librarian who has ever considered building an online credit-bearing information literacy course? This is is for you; it contains syllabi, open source content, activities, and resources for building your online class. This site also documents the process at my institution (King University) of creating an online information literacy course. 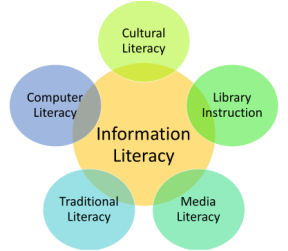 Information literacy is defined as "Information literacy is a set of abilities requiring individuals to "recognize when information is needed and have the ability to locate, evaluate, and use effectively the needed information. "﻿1﻿ Librarians in the 21st century are exploring new avenues for teaching these skills, which have been traditionally taught face-to-face. Many librarians, such as William Badke, opine that librarians should offer information literacy classes online. This website will explore my journey in developing an information literacy course for King University, a liberal arts institution with 3,000 students, online and blended programs. This course will be taught online to traditional, remote, and online students. My name is Seth Allen and I'm the Online Instruction Librarian at King University. In addition to being a librarian to distance students, I teach sociology online for a community college. I do not claim to be an expert in course design or information literacy, but I do hope to share my knowledge of the course design process for an information literacy course to other librarians intending to do the same thing. Connect with me on LinkedIn, my portfolio site, or email me (swallen@king.edu) with any questions about the process.